Heritage Industrial Services was recently hired to perform the dismantlement, removal and recycling of decommissioned equipment consisting of (2) Chillers and (2) Drive Trains. The first task associated with the project was the rigging and removal of the equipment from the existing facility. The equipment was disconnected from all associated piping and utilities. Upon being disconnected the equipment was removed utilizing hydraulic jacks, skates and a 15,000 lb. forklift. After being staged outside of the facility the equipment was loaded onto trailers with a 35 T Hydraulic Crane. It was then transported to a designated laydown yard within the facility for dismantlement and recycling. After the equipment was transported to the designated laydown yard it was offloaded utilizing a 35T Hydraulic Crane. Upon being offloaded the dismantlement process of the equipment began. 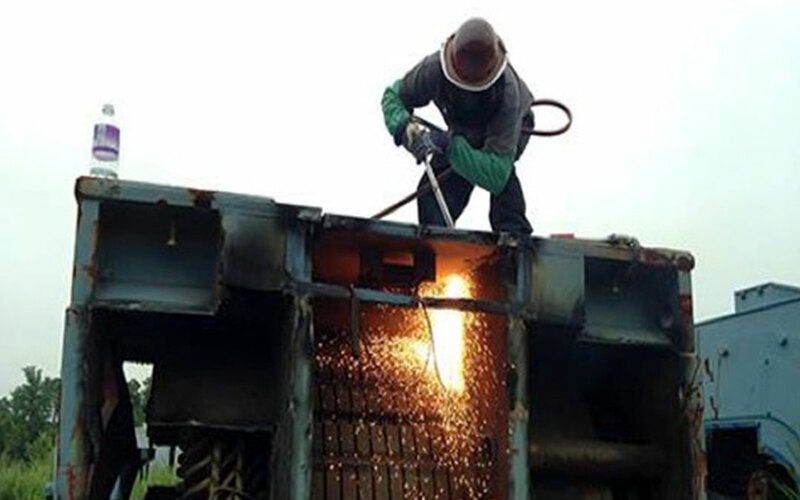 Employees utilized a combination of oxy/acetylene torches and a hydraulic excavator equipped with a grapple and shear to dismantle the equipment in sections that could be managed and loaded onto trailers. After the equipment was loaded it was transported for further processing and recycling to a predetermined facility. The project was completed safely, on schedule and without incident.